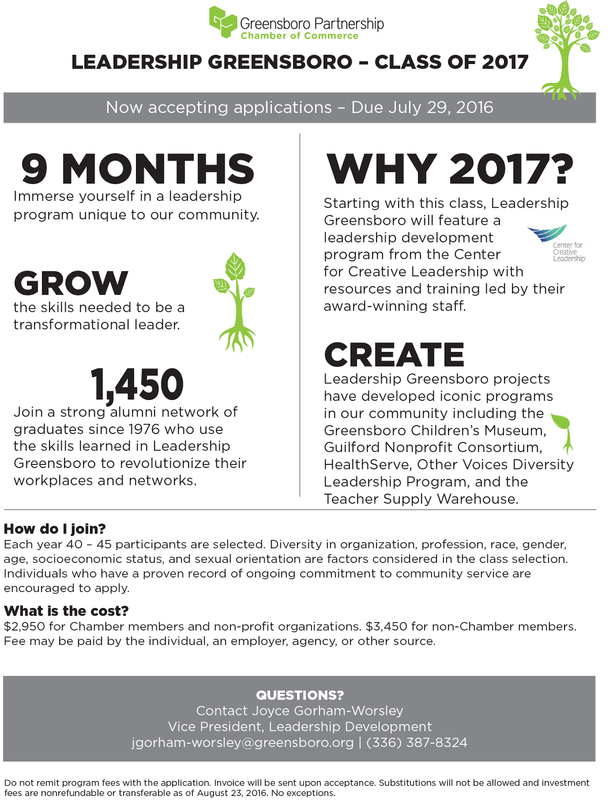 "June 14, 2016 – (Greensboro, NC) Beginning this fall with the Class of 2017, Leadership Greensboro will begin offering leadership development programs from the Center for Creative Leadership as part of its standard curriculum. Participants will complete a three-day intensive on-site at CCL with resources, analysis, and training led by their award-winning staff. Each year 40-45 participants are selected for the nine-month long, immersive leadership program. Diversity in organization, profession, race, gender, age, socioeconomic status, and sexual orientation are factors considered in the class selection. Individuals who have a proven record of ongoing commitment to community service are encouraged to apply. Applications are due by July 29, 2016. 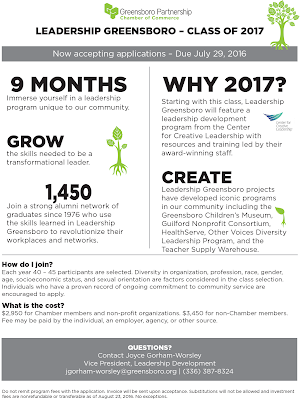 Contact Joyce Gorham-Worsley, Vice President, Leadership Development at (336) 387-8324 or jgorham-worsley@greensboro.org for more information on Leadership Greensboro or to submit your application."